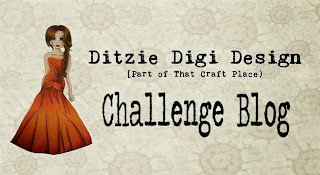 Cuttings from the craftroom floor: Ditzie Digi Design challenge blog launch! The time has arrived for us to launch and put into action our new challenge blog for Ditzie Digi Designs. For those of you who haven't heard of this before, I am part of an exciting new venture with some fabulous artists to create digital images for you all to colour. There are a range of different styles of drawing being done so there is something for everybody! New images are being added all the time...... Check out the Etsy store to grab some of you own. and here is my inspiration card. I have used an image by a very talented artist called Kelly Rhodes. At the time of writing this post, this image isn't in the store but I bet she will be by the time this goes live!!! This is an 8x8 card to make the most of the colouring, She is of course coloured with my brand spanking new copics. The papers are just plain Kraft and hammered bronze card. The numbers sheet is a section from a sheet of Graphic 45 'old curiosity shop' papers...... I thought the colours were perfect together. The wings and cog are wooden cuts from Ditzie Designs and I cant get enough of them!! Check out the challenge blog (link at the top of post) to see the full rules and what else the talented DT have been doing with a wide selection of images.